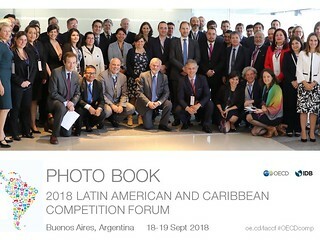 The 16th meeting of the Latin American Competition Forum took place in Buenos Aires, Argentina on 18-19 September 2018. It was hosted by Argentina's Competition Authority, National Commission for Competition Defence (CNDC). There is no uniform definition of the informal sector in economic literature. Research findings indicate that economic development alone does not lead to a reduction of the informal economy. Although competition authorities may contribute to the formalisation of firms operating in the informal economy through advocacy initiatives, a more direct concern is how to deal with informal firms in competition law enforcement actions and cases. This session tried to identify and discusses the impact on competition in the formal economy, as well as how competition authorities can contribute in solving informality issues and tools that are effective. The mechanisms of peer review vary, but it is founded upon the willingness of a country to submit its laws and policies to substantive questioning by other peers. The process provides valuable insights into the country under study, getting to the heart of ways in which each country deals with competition and regulatory issues, from the soundness of its competition laws to the structure and effectiveness of its competition institutions. Peru has already undergone a first peer review in 2004. In 2007 and 2012, follow-up reviews made together with other Latin American countries also reported the progress of Peru's competition law and policy. In 2018, Peru’s competition law and policy has once again been subject to such a review. A final report should be launched soon. Industrial policy describes the set of interventions that governments use to affect the economic structure of the economy. Its success or failure therefore has a huge impact on the extent to which a country can achieve inclusive growth. Individual industrial policies can broadly be considered to have either horizontal effects on each industry, or selective effects on certain markets, sectors, firms, technologies or places. This session discussed the issues that arise and the experiences of competition agencies in Latin American and the Caribbean when encountering these policies.